Hi there, we have had a Light Sussex hen now for a good 10 months, we got her as a hen, she was a show bird, and the breeder saad she wasn’t sure if was laying, anyway we took her home, she looked like a good hen. She’s a big girl, and it has taken her a while to be accepted by the flock, however she wasn’t laying, and I mentioned to the other half, how she might be nice for christmas, bit of sage n onion, well funny thing is she starting the very next day, I swear they can understand us, now I just have to get her to stop doing her rooster impression in the mornings and we’ll all be happy. Hi Keepers, just thought for those who may be intersted in the different breeds and a bit of history thrown into the bargain. The golden laced wyandotte is a golden color with black around the edge of every feather and black tail. Joseph McKeen of Wisconsin was the originator of the Golden Laced Wyandotte. In 1880 he crossed Silver Laced Wyandotte females with a large “Black Red” patterned fowl of unknown origin called the Winnebago. The variety was admitted to the American Standard in 1888. MINORCA. The black (occasionally blue or white) Minorca is the largest of the Mediterranean ‘light’ breeds, and famous for its extra-large white eggs. A proud and stately chicken which does surprisingly well in confined surroundings. The Minorca can be traced back in Britain to 1780 but its origins lie in Spain, perhaps originally as the ‘Castillian’. The Castillian is the common black fowl of Spain, the name of Minorca being derived from the port from which most of the birds were exported. By selective breeding, the head features of the Minorca became famous during the twentieth century, with the white almond shaped lobes particularly striking. The Sussex chicken was created over a century ago in the county of Sussex, England. The original colours were the Brown, Red and Speckled, and the Silver is the latest variety. The breed was prized as table fowl more than one-hundred years ago and, more recently, the Light Sussex was very popular for the laying trials of the 30’s. Today they are a popular breed for exhibitions as well as a backyard breed. The breed has made a huge contribution to the poultry industry and is even an ancestor to the modern broiler. Sussex is one of the oldest breeds of chicken that still exists today. 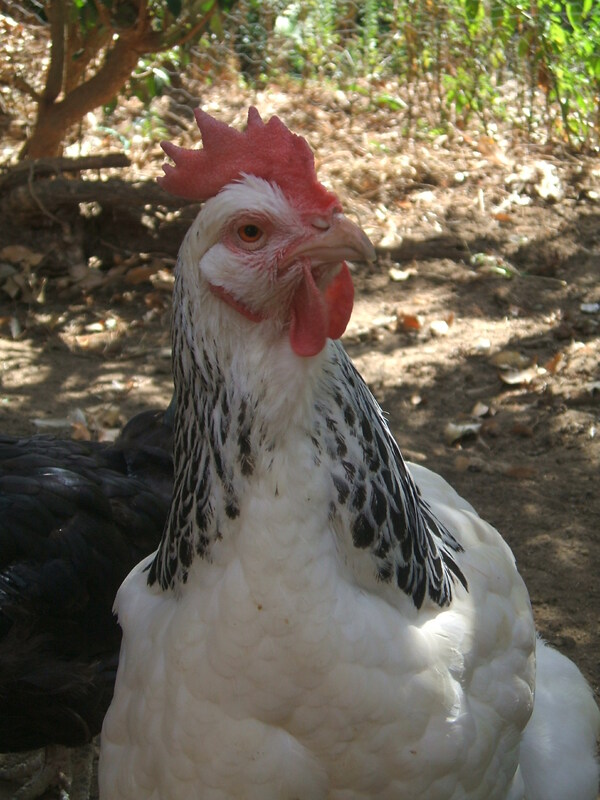 The Sussex was bred to be a dual purpose bird and is one of the most productive breeds of poultry. They lay large eggs that are cream to light brown in colour. A person owning a member of this breed should expect approximately 240 to 260 eggs a year, although the light and white varieties are the best choice for layers. Recently there has been an olive green coloured egg introduced to some Light Sussex breeds, although these green egg layers are very rare. These are the brown chickens you get if you buy layers from a commercial poultry farm. The names Shaver and Hyline denote the different commercial breeding companies that created the bird. The two breeds look very similar and are a complex genetic mix, designed by humans over many years to get a strain of bird that is a good layer, that eats less for higher production and produces on average 300 eggs per year at its peak. Hi there keepers, it’s been all go on the chicken run, what with the untimely demise of Nellie, and the disappearance of the new Nora ( light sussex), while trying to finish the coop, and keep the girls off of the freshly sown grass seed, juggling act springs to mind, I think it’s the owners that become like their animals, for sometimes I feel like I’m running around like a chicken. Fortunately we found Nora first thing this morning, in the neighbours garden, as she is a full sized hen, she’s pretty big, it was hard really , it was like seeing a big white pillow floating through the undergrowth of next doors garden, as she is not familiar with us yet, we had to shepherd her back to the run with a piece of bamboo. Both Manuella the Minorca and Betty the Wyandotte, went over to say hello to Nora thinking it was their friend Dorothy, but soon found out differently as Nora launched into an attack om these strangers. Being back out at the breeders, the lovely Raewyn, gave me new enthusiasm, there are so many amazing looking breeds, some of the bantams are fascinating little birds. I can see us getting more soon, also I’m hoping for Nora to lay an egg today, as she has come from a run with a rooster present, there’s is every chance the eggs will be fertile. Nora was in the show birds run, so she is from good stock. Hopefully things will now settle down again on the run.